Not all the memories are positive. Pine needles shed by a dying tree wormed their way under my toenails. Brittle branches breaking under slight brushes. Dragging a dead, undecorated, half-denuded tree out the front door and into the woods to decompose was a special, family affair. My mother taught me how to walk in the forest without breaking understory plants, how to identify footprints and how to leave no trace of our hikes. Killing a tree for Christmas was weird and inconsistent with everything else I was taught. On TV I’d see the giant, Rockefeller Center Tree and feel simultaneously awed and sickened. I only later found out that The Rockefeller Center donates the old Christmas Tree to organizations like Habitat For Humanity. As a forest-dwelling, trail-running tree lover I’d rather not cut trees down to temporarily decorate my house and the more I learn about holiday tree farming the less I want to buy one. Every year 25-30 million trees are cut and sold in the US each year. The vast majority of these come from farms which use pesticides and fertilizer that can end up in watersheds or harming local wildlife. In some regions, holiday trees are shipped hundreds of miles by truck to market which generates atmospheric CO2. The monoculture of tree plantations is also a concern for the surrounding wildlife. Luckily most of these trees are destined to be recycled into fish habitat, mulch or dune retainers after the holidays but this reuse doesn't cancel out their position as disposable, resource-intensive commodities. Dying, drying holiday trees also pose a massive fire hazard when left unattended or lit with faulty lights. On the other hand I disliked the look and feel of plastic trees. Their strange branches reminded me of toilet brushes which is, literally the way the first industrial, artificial trees were made. 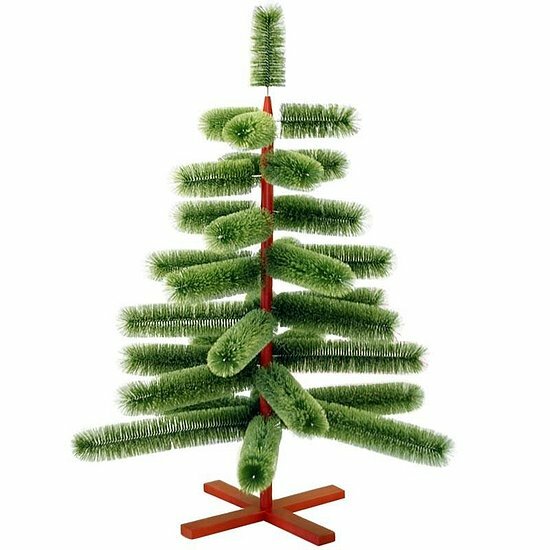 Beyond aesthetic issues, PVC trees don’t last terribly long. Most last less than 10 the ten years it would require to make them carbon neutral, factoring in the footprints of the materials, construction and shipping (often from overseas). In addition, artificial trees are potential vectors for lead contamination, and may be one of the leading contributors of lead poisoning and exposure in young children in the US. When thrown away, artificial trees sit in landfills for centuries as they slowly degrade. (Incidentally they also pose a fire hazard). A bald eagle nobly surveys the final resting place of the artificial holiday tree. Our City Forest is happy to present an alternative to tree cutting or PVC trees. We rent out living, potted holiday trees that you return to us at the end of the season. Once they’re returned they’re re-planted and are allowed to continue to grow. If you rent the same tree year after year the tree can grow with your family. Once the tree is too large to retain in the home it is used as reforestation stock or planted as a member of our urban forest. Redwoods and other drought-intolerant trees are brought to suitable planting sites where water is more readily available. If I had grown up in an area that offered rental trees I would have insisted on getting them. I might have even insisted on planting one in my back yard after the holidays so I could continue to enjoy it year round. It makes no sense for holiday cheer to be a death sentence for the tree at the heart of the festivities and far more sense for the tree to be a living reminder of holidays past. So please, rent your holiday tree today.